Peaked at #96 in Australia, 2012. I'm actually starting to think that I dislike the original song. It's certainly not interesting and it just draaaaaaaaaags on. Thank you X Factor for making a shorter and more accommodatable version. 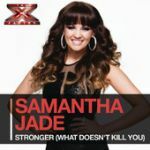 Decent cover from Sammi's X-Factor journey.